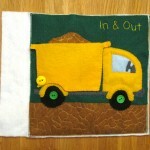 This dump truck was designed to go along with the forklift page I created by request. Since I wrote “Up & Down” on the forklift, I wanted to do another set of opposites on the matching page. 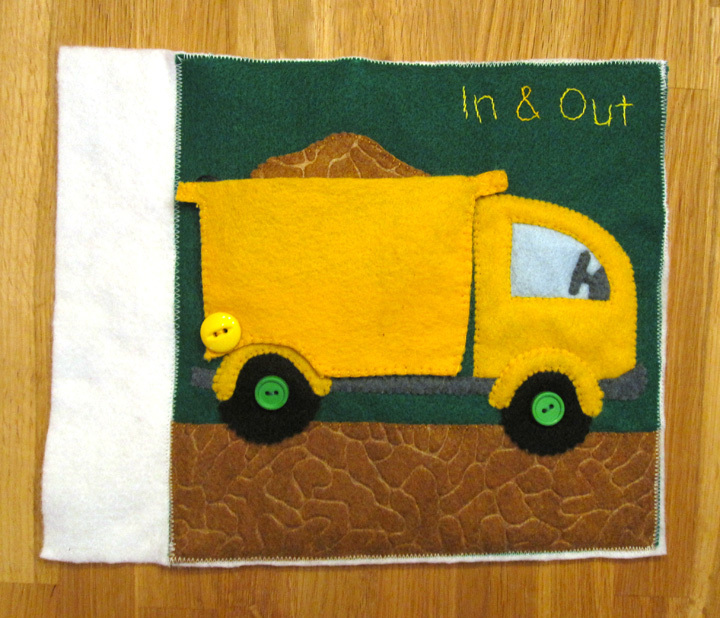 A dump truck with “In & Out” sounded perfect! To make this page I used: green background felt, felt (in brown textured, light blue, gray, gold and black), 3 buttons, 1 grommet, 1 snap, ribbons and embroidery floss. I started by free-hand cutting out the ground. I set the page beside the forklift while I cut so the ground matched up. I sewed it down when it was done. I then pinned down all the truck parts except the dumpster. That way I knew everything was centered correctly on the page before I began to sew. 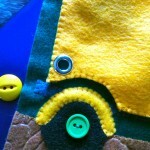 I sewed the steering wheel down with it layered on top of the light blue window. 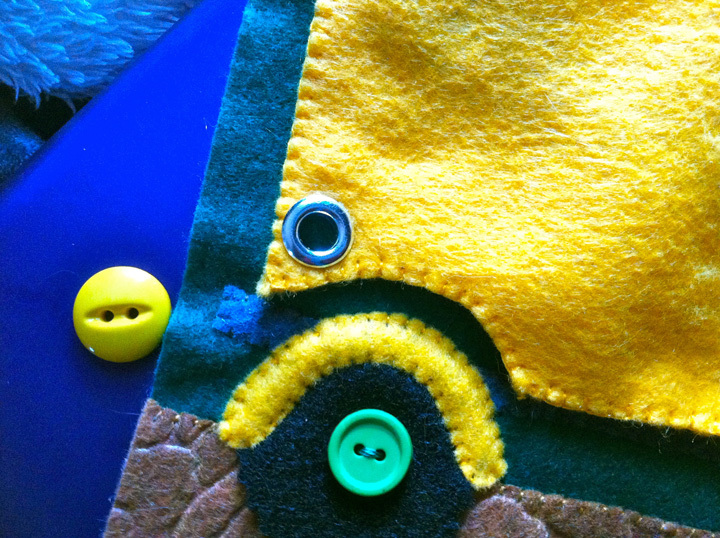 Then I layered the gold truck cab over top and sewed it down. I never had to sew the light blue at all. Next I sewed the gray truck bed/bumper down. The wheels on this page don’t turn because I wanted to have that curving part on them (sorry, I don’t know car parts!) I pinned the wheels down then attached then with a button in the center. I then sewed the gold curves down over the top. The bottom of the wheel is loose, but doesn’t turn. My next step was to cut out two sides of a dirt pile shape. I free-handed it and just made sure it was narrower than the dumpster. With one end of an ~8″ ribbon sticking out of one side, I sewed the halves together. 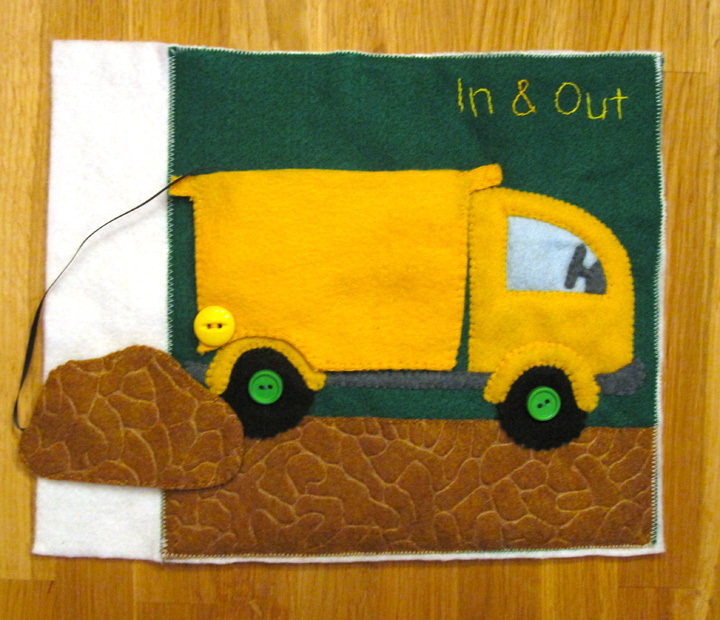 I then sewed the dumpster into a pocket with the other end of the ribbon caught it the upper left corner. I marked on the pattern where I sewed the dumpster with a dashed line. 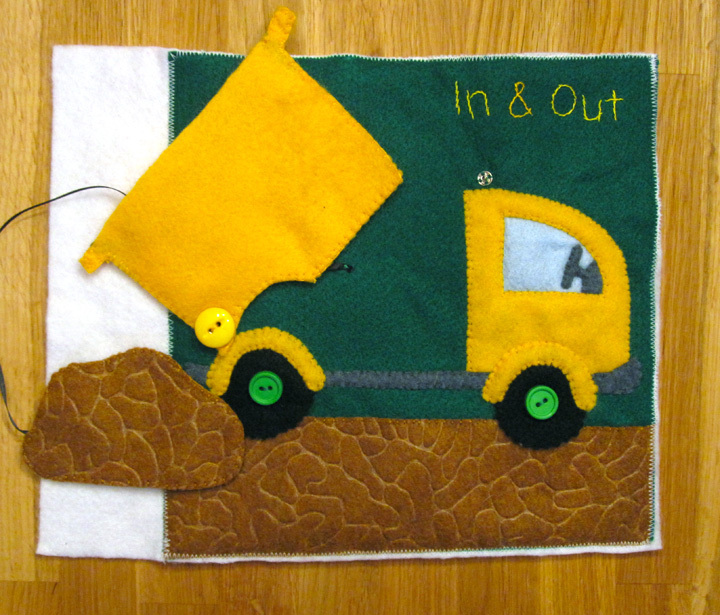 To attach the dumpster, I added a grommet in the lower left corner, a snap in the upper right (put the other half where it lines up on the page) and sewed a button through the grommet hole. To keep the dumpster from spinning all the way around, I sewed a scrap of ribbon to the back and attached it to the page. You can see it peaking out in the photos. The final step was sewing the lettering. I actually just sewed right through the pattern paper then cut it away. Nice and quick! I used stem stitch. This page goes with the forklift page I made by special request. Stop by the Facebook page if you’d like to make a suggestion. For more quiet book pages click here. 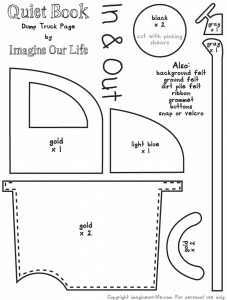 This entry was posted in Crafts, Quiet Book, Sewing and tagged Crafts, Free, Patterns, Quiet Book, Sewing on January 3, 2012 by Stephanie. 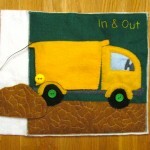 I love the dump truck! But dump trucks go with diggers, not forklifts. With the ideas on movement that your pages have provided, and the simple image at http://www.art.com/products/p10284123-sa-i804441/simon-hart-digger.htm I think I can figure this one out 🙂 So if you like, this time I’ll provide a pattern. Show just how much I know about trucks (nothing!) hehe. Jax just isn’t into them right now. He likes trains and cooking. I didn’t even know there was something called a “digger”. If you make a digger pattern, I’d love to feature it here! I’m sure it would be super cute. I don’t understand where the other end if the ribbon is? I’d it sewed ino the corner of the dumpster? 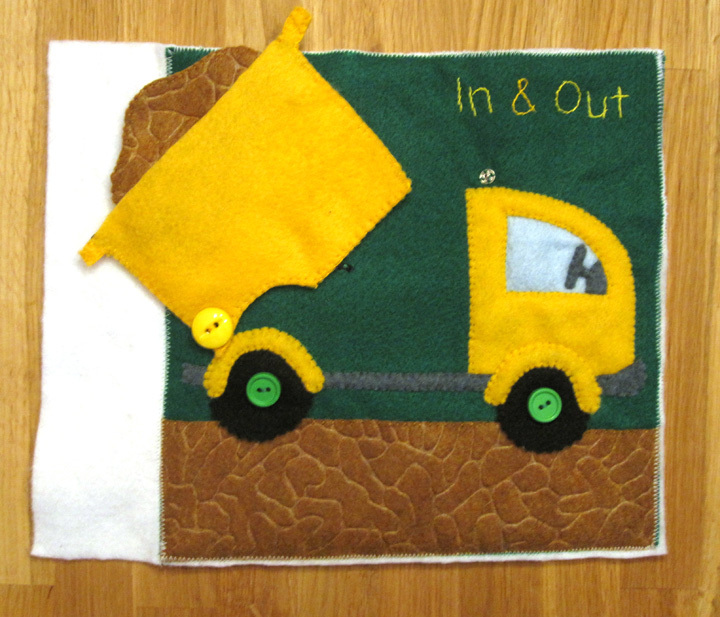 Or is it sewed onto the actual page behind the moving dumpster part ? 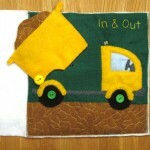 I am making a quiet book for my 2 yr old grandson, he is CRAZY about forklifts, & dump trucks. So hopefully mine are half as good as yours. You are AMAZING!! Thanks. Right now my patterns are personal use only, but I will be sell commercial licenses soon. Shoot me an email and I can respond as soon as they are set up. Thanks! I wasn’t able to get the grommet to work for the forklift they wouldn’t go through all the layers. I have found larger eyelets to try for this truck. I must go through all layers is that correct? Do one work better than the other? Eyelet vs grommet? Thank you. You do amazing work. 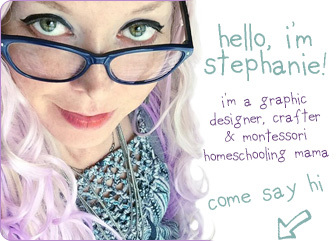 I love your pages. 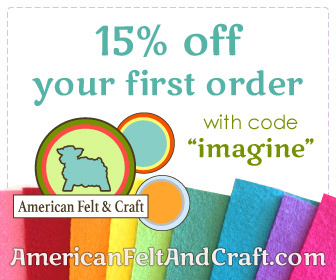 I was using thin craft felt on this one. You could possibly sew a button hole. You just need a hold with sturdy edges. Hope that helps! 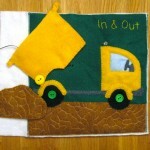 Where can I find the textured brown felt used in the dump truck quiet book page?